The reason why this blog has been as empty as an Alastair Cook interview is because I have managed to persuade the sages at Cricinfo to employ me. Hopefully I can keep this blog going with a few more opinionated pieces. I am the only one worried that England's A-grade talents will be coached by Ian Bell? Presumably he's there to work on 'body language' and 'presence' (for their walk back to the pavilion after a well-made 15). The England selectors will today reveal their Test and one-day squads for the winter tour of South Africa with Steve Harmison’s international future and the balance of the Test side the pressing concerns. Ever since Duncan Fletcher’s reign, England have been wedded to a policy of playing five frontline bowlers. A luxury that most other sides can rarely afford, it is a strategy that captain Andrew Strauss and coach Andy Flower are staunch defenders of. While England’s top six have misfired for a few years, Jonathan Trott’s assured century in the last Ashes test and Kevin Pietersen’s expected return to the side, means Ravi Bopara is the only batsmen likely to miss out. Bopara’s career is drawing unwelcome comparisons with fateful figures of Mark Ramprakash and Graeme Hick. Joe Denly, meanwhile, has promised enough in his recent one-day outings to tour both as a backup batsman and a possible challenger to opener Alastair Cook. With Flintoff now retired, concerns linger over pairing Matt Prior and Stuart Broad at six and seven against a strong quartet of South African pacemen. It would mean bringing Tim Bresnan or even Liam Plunkett in at eight to bulk up a lower-order that was so instrumental to the Ashes success. Both are worthy triers and enjoyed good domestic seasons but lack class with the ball and appear better suited lower down the order in Test cricket. The pace and bounce of the pitches seen in South Africa during the Champions Trophy have drawn calls for Harmison’s inclusion. But he insists he won’t travel as a backup and guaranteeing a starting spot for a notoriously bad tourist could prove a gamble too far. Dropping Harmison would end a frustrating career and signal a commitment to the future. James Anderson, Broad and Graham Onions each had their moments this summer, proving dangerous when conditions suited but none are natural enforcers in the way Flintoff was and Harmison should have been. This lack of incisiveness is what makes a fifth bowler attractive. Yet a dearth of obvious candidates means Ryan Sidebottom will probably tour as a backup seamer. Sidebottom was fortunate to receive a central contract and has done little over the last year to counter suggestions that he is a spent force at Test level. Test squad (possible): 1 Andrew Strauss (capt), 2 Alastair Cook, 3 Ian Bell, 4 Kevin Pietersen, 5 Paul Collingwood, 6 Jonathan Trott, 7 Matt Prior (wk), 8 Stuart Broad, 9 Graeme Swann, 10 James Anderson, 11 Graham Onions, 12 Joe Denly, 13 James Foster (wk), 14 Tim Bresnan, 15 Adil Rashid, 16 Ryan Sidebottom. ODI squad (possible): 1 Andrew Strauss (capt), 2 Joe Denly, 3 Jonathan Trott, 4 Paul Collingwood, 5 Eoin Morgan, 6 Owais Shah, 7 Matt Prior (wk), 8 Luke Wright, 9 Stuart Broad, 10 Graeme Swann, 11 James Anderson, 12 Graham Onions, 13 Ryan Sidebottom, 14 Tim Bresnan, 15 Adil Rashid. A short tournament with the world’s best teams seemed just what one-day cricket needed after a pitiful England Australia series. Yet with just the final remaining, the only remotely close finish the Champions Trophy’s 13 matches has produced was Australia’s last-ball victory over Pakistan last Wednesday. Flintoff’s rejection of an England central contract is another triumph for private capital over national good. It was the England and Lancashire teams that nurtured his development into an international star worthy of private interest, yet as he’s auctioned-off around the world it's Andrew ‘Chubby’ Chandler who collects the rewards. There is nothing new about mercenary cricket. After all, the sport developed with wealthy English patrons hiring freelance ‘professionals’ in the 1700s. Of course back then the game was also defined by gambling and match-fixing. But in today’s post-crisis age of austerity it is particularly galling to read Chandler gloating about the deals he is to make. Yet concerns that freelance cricketers embody a final ‘globalisation’ of the sport remain unfounded. Developing a gifted child into a world-class athlete is a lengthy and risky investment. Even now the ECB pays for Flintoff’s rehabilitation. National boards have to realise that they remain central to the developing world order. Young players must still learn in domestic cricket before getting the chance to play abroad. They should use this power to ensure a cut of the deals and protect the interests of the national team. It’s time to regulate the agents and ensure successful cricketers return money to the people that made them instead. The brilliance of women’s cricket in England has brought them success and respect, so why does Npower insist on reducing women to sexed-up props? England now hold the World Cup, the Twenty20 World Cup and The Ashes. They are the best women’s sports team on the planet, and in Clare Taylor, have the finest batswoman in the world. So why can’t we extend this respect from the field to the presentation ceremonies? There can be few more unedifying spectacles than, just hours after the women’s victory, the presentation ceremony of the men's world cup. Giles Clarke and ICC president Haroon Lorgat, introduced by name and applauded, joined a stage where two anonymous women were paraded as Npower’s furniture. While the players dutiful shook hands with administrators, the ‘Npower Girls’ stood by unacknowledged and non-existent. Standards and attitudes to women in cricket have progressed, it is high time the sponsors caught up. South Africa have been accused of being a robotic and mechanical team. Today was no exception as they efficiently swatted an ineffective England team aside, and marched on as tournament favourites. The danger of Twenty20 cricket is that, like its 50-over cousin, the result can be decided early on, leaving the rest to unfold as a formality. Once Pietersen had joined the openers back in the dugout, at 25-3 off 5 overs the game was up. South Africa have better tools than England for the Twenty20 contest, but England's tactics have to be questioned. Winning the toss and choosing to bat places pressure to set a total. Too often England batsmen can't cope with this. Denied a quick start it was visible that Shah and Collingwood were unable to asses a good total. They were indecisive over whether to attack or regroup and in the end did neither. While Foster is an excellent keeper, Prior at six would bring much needed runs and, crucially, would help unclutter the minds of England's top order. South Africa's tight bowling brought poor shot-selection as England struggled to find any momentum. Defending 111 was always going to be difficult, but in offering 46 singles, England did themselves no favours. 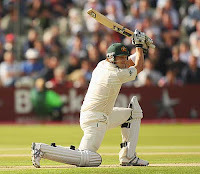 Kallis led the gentle stroll to victory, leaving England with a lot of work to do to progress. With a new coach and untried attack today’s squad feels like a new era for English cricket. But haven't we said that before? Should they opt for a quartet of quick’s alongside Graeme Swann, the bowlers would have just 55 caps between them. This would be their most inexperienced attack since Anderson was joined at by Sidebottom and Tremlett at Lords two years ago to skittle India out for 201. Back then England had a new coach in Peter Moores and an attack with pace, swing and bounce that felt capable of challenging Australia. Finally, it seemed, England had left 2005 behind. Two years, one coach and two captains later it seems the new dawn of 2007 was not quite what many imagined. 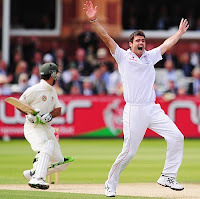 But Flower is not Moores and it shows in the way both Bell and Harmison, despite thier good form, were resisted. While both may feature at some point this summer, they need to prove their hunger in the shires for a while longer. Bopara at three offers confidence that exeeds his perfomances at international level, but perhaps that is just what the position demands.